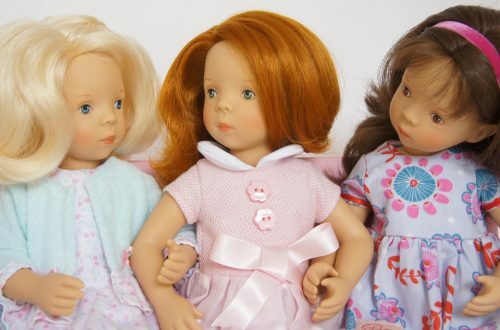 Hannah, pictured below, is a beautiful all vinyl 50cm doll with brown fixed eyes and long brown hair which is suitable for girls from age 5. She arrives dressed in a T shirt and jodphurs with a fleece jacket, as well as her riding hat, half chaps and boots. She also comes with a dressage outfit consisting of a black jacket, white cravat, and white jodphurs, as well as various bits of kit including a crop, dandy brush and a sponge. Happy Kidz Anna is an all vinyl 50cm doll with lots of joints making her highly posable so great for seating on a horse. She has very long blonde hair worn in plaits and blue fixed eyes, and she wears a smart red jacket, white cravat and jodphurs and her riding hat. If you already have a Gotz doll between 46 and 50cm then this set of riding clothes will fit them. The set includes a body protector as well as a T shirt, jodphurs, boots, hat and a crop, so very realistic. Gotz also have a range of horses available for their dolls. There are 3 small ponies (27cm high) and two large horses. There is a chestnut pony, a Haflinger and a white Fairytale horse – and the fairy tale horse has a sound function with clip clops, whinnies and snorts! The pink horse rug available from Gotz fits these ponies. You can see the size of the small horses compared to a Hannah doll in the photo below. New for 2014 is the Combing Horse with long hair and a brush which is 50cm tall. We are loving this horse at Petalina because it is so big and the right scale for the dolls! As of 2017 there is a large black combing horse too and a unicorn, with separate saddle and bridle. 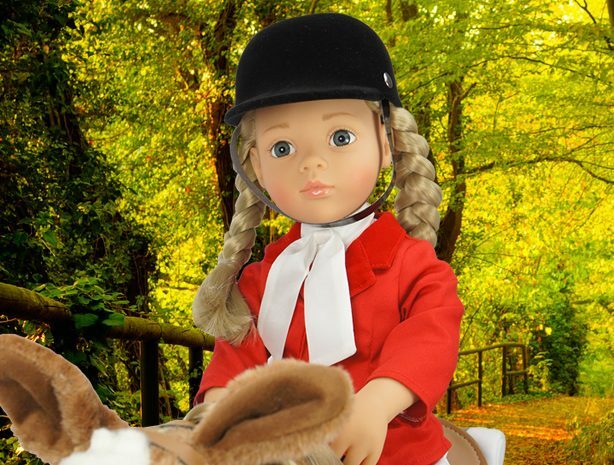 Bonnie & Pearl have also brought out a Riding Outfit which consists of a smart black jacket, white shirt and leggings, black boots and riding hat. 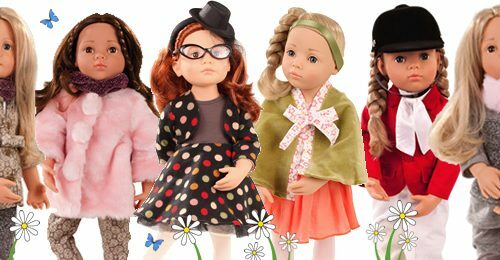 (At the time of writing this we have not yet received the outfit and haven’t tried it on any of the other dolls we stock). Gotz Just Like Me have a riding doll available now. She is small at just 27cm so the small horses are needed. Would not be able to reach the stirrups though! If you have a look on the main Gotz website, for 2018 they have child sized ride on ponies available!